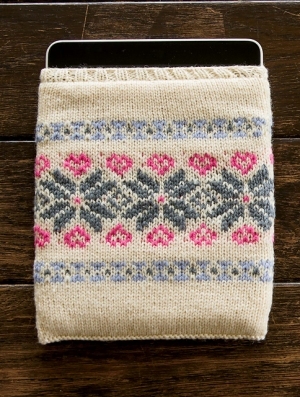 Taken from Interweave Knits, Gifts 2014: "The Sweetheart Tablet Cover protects your gadget in style with a full lining. The double fabric is cushy and colorful." This pattern is from Interweave Knits, Gifts 2014, pg 48 - Sweetheart Tablet Cover. Size US 6 - 16" circular needles (or size needed to obtain gauge), stitch markers, and a tapestry needle are required but not included. Gauge: 24 sts and 30 rnds over 4". Color Shown is Cream, Dusty Blue, Sweatshirt Grey, and Honeysuckle. If you like the Cascade 220 Superwash Sweetheart Tablet Cover kit, then you may be interested in some other kits covered in our Gifts collection.